Earns a higher score than 7/27. If Fifth Harmony has taught me anything, it's that the girl group craze apparently hasn't faded away just yet. Culled from the abundance of soloists competing on the TV show The X Factor USA in 2012 by famed producer, reality show judge, and tight-shirt enthusiast Simon Cowell, Fifth Harmony is a revival of sticking a five seemingly random vocalists together, strapping them in revealing outfits, and sprinkling them into the music industry. I assumed that went out of style when those burlesque superstars The Pussycat Dolls had faded from memory, but... look what we have here. After releasing their debut album, "Reflection", in 2015, Fifth Harmony returned to the forefront with 7/27, boasting that we're about to see "a side of Fifth Harmony that no one's really seen". The album's title refers to the day they become a group, July 27, 2012. And, rolling with the theme of the number 27, it was released on May 27, 2016. And nobody in the group is over 27. And it took me 27 minutes to figure out who "Fetty Wap" is. Opening with the pounding sax-laden That's My Girl, it sounds like they're starting bold with an outright flashy dance number. If they're trying to impress me with some sweet harmonization and raw synthy power, they're succeeding. I was worried that the album would start out with bland R&B claptrap, but I'm pleasantly surprised. It's fun to be wrong. Bleeding confidence, That's My Girl secures their position as a group that wants your attention. Arguably their most successful single to date, Work From Home features a catchy and simple backing instrumental jingle that wouldn't feel out of place as a ringtone. Actually, I wouldn't mind it as my doorbell chime, either. 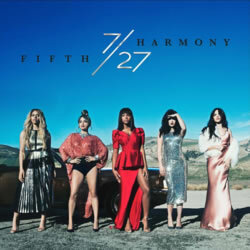 Over this, the girls (minus member Lauren Jauregui, who apparently rarely gets much chance to shine — her primary contribution to their previous album was breathing noises) moan and groan while advising their men that they should stop going to work and instead "work from home", a euphemism for making love instead of providing the family with income. Some of the lines are just silly. "I'm sending pic after picture, I'mma get you fired." That'll go over well. "Nothing but sheets in between us / Ain't no getting off early." Ewww. This track also features Ty Dolla $ign, one of the few people in the industry that can get way with using a non-alphanumerical symbol in their name and not be considered illiterate. With lyrics like "Can you make it clap, no hands for me? ", it's clear he was going for the gentlemanly approach. "She ride it like a '63..." So you're saying she is getting old and may need a replacement muffler? I've heard this tune on a few radio stations where they splice out his part entirely, perhaps because they realize how pointless it is to disconnectedly wedge an extra singer/rapper into a pop song. Moving on with The Life, a track clearly about living it up and "feeling rich", may not connect with all their fans — who DOESN'T have a million dollars, sipping Mai Tais on the beach these days after all — but when singer Camila Cabello's voice gets chopped up with lyrics like "This is the life, life, life" and... uh, "This is the life, life, life", you'll automatically forget about how pretentious and boastful the lyrics are as you party down with the standard pop dance fare. But they need grounding, and that's where Write To Me steps in, featuring a slower beat and some acoustic guitar to slide in some sultry and equatorial flavour. It's a nice departure from their more well-known sassy pulsations and feels like they are actually people with emotions, rather than carbon copies from a Max Martin music machine. When I heard the first sound that came from I Lied, I pointed at my screen and said to myself, "I think Jack Ü was involved in this! That sounds VERY much like a distorted wail they'd use!" And, sure enough, I was dead wrong, but the influence of the Skrillex + Diplo duo squeaks in now and again. Unfortunately, this track won't be the one most fans will remember, as there's nothing particularly standout here. All In My Head (Flex), sporting a more reggae vibe, is the album's second single and pulls from "Flex" by DJ Mad Cobra, which in itself draws its sources from "Just My Imagination" by The Temptations. While much of this song doesn't click with me as anything but "meh", the grievously brief 80s pop interludes by Lauren Jauregui are a highlight and a welcome, if not badly needed, respite from the otherwise Who let Toto come in and compose for ten seconds at a time? This song features hip-hop artist Fetty Wap from time to time, who doesn't really add anything major to the song. He's active proof that I really like enunciation in music because half of this guy's vocals are absolute tongue bumbling that make no sense. The 80s new wave ballad vibe sneaks in again with Squeeze, and it feels REALLY good. Channeling a little Carly Rae Jepsen, there's a warm essence with all the pads and the uplifting piano playing together. It's good to hear a bit more playfulness and lightheartedness now and again. Another low-key acoustic number, Gonna Get Better, follows with a bit of ambient dancehall. The vocals croon of how there's a false air of dissatisfaction in a relationship (and the always reassuring line, "I won't leave you for a money man"), but the authenticity of their emotions isn't exactly clear here. I think they're just going through the motions of a typical song about relationships going sour. It would really have helped if Fifth Harmony wrote their own lyrics. The Jack Ü spirit crawls back in with Scared Of Happy, and although they again aren't involved at all, I can't help but notice how producers Stargate and BloodPop (who?) use similar techniques and instrumentation. Plus, that weird fuzzy shifting of the vocals during the chorus, combined with the percussive clanks, are undebatably influenced by Jack Ü and that group's success-leading style. The music itself drives how memorable this song will be, far more so than the work of the Fifth Harmony vocal work. To close off the album, Fifth Harmony has enlisted the work of legendary rap artist and denim devotee Missy Elliott in Not That Kinda Girl in a song clearly influenced by the dance-pop craze of the mid-80s. With an aura not unlike that of Prince's "1999" or Ray Parker Jr.'s "Ghostbusters", the track will probably offer a divide between the younger generation who's not all that interested in this sound and older listeners whose ears will melt with nostalgic bliss. Missy Elliott is in typical form; I haven't heard much from her in the past few years, so it's nice to see she's still active. If you picked up 7/27's Deluxe Edition, you'll be graced with two bonus tracks. Dope is a slower tune coated with a thin layer of sleaze whose backing synths secure my position that the songwriters listened to a fair amount of music from the 1980s before prepping these songs. Also, if you want to hear the members of Fifth Harmony swear more than usual, here's the place to do it. No Way is the other bonus, and it's another slower-paced crooner highlighting how, although they aren't perfect, they believe their imperfections make them an excellent choice for a mate. Yep. Earlier in the album, they were singing about how awesome their lives are, but now they're addressing their flaws. They don't mention WHICH flaws. Maybe they have a dimple in the wrong place. There's a certain emptiness to this song, not in its instrumentation but in its soul. Again, they didn't write this song, so it's not even their real emotions. 7/27 has its high points and its lower, less memorable aspects. The music on 7/27 ranges from astoundingly catchy to bland and suffering from "been-there-done-that-a-thousand-times syndrome". It starts off strong but tapers off as time goes on. When they score, they score big. When they don't, they come off as characterless just as many albums by girl groups that have come and gone. One member of Fifth Harmony claimed that, on 7/27, "we're showing who Fifth Harmony really is behind closed doors". The problem with this statement is that the album doesn't give any personality to the individuals, and this is a problem when you don't have a focus on any one writer or singer. Additionally, while the members often get their own solo parts, you really have to listen carefully to figure out who is singing what. Only Camila Cabello is notably different with her cuter vocal style, but otherwise, you could pretty much interchange some of the members with anyone else and not notice the difference. I remember back to my younger days growing up with the Spice Girls, and you could very easily tell who sang which part; each member also had their own clear personality. Fifth Harmony hasn't quite achieved that yet, and to this point they remain five girls synonymous with each other. Lamentably, as I've mentioned time and again, if you don't write and compose your own songs, you're limited as to what you can do as an artist. With over a dozen producers and even more songwriters toiling on 7/27, I can't imagine a unified vision is even possible. The members of Fifth Harmony just have to roll with what they're given. Are they great vocalists? I wouldn't doubt it. Are they great artists? We'll never know unless they contribute more than a few high notes.